Councillor Matt Carthy was last week elected the first ever Sinn Féin Mayor of Carrickmacross Town Council. Here he speaks to ELLA O'DWYER about his political background, the place of youth in the republican struggle and his views on the role of Mayor. Matt Carthy said he was proud of his election as Mayor of Carrickmacross and dedicated it to Sinn Féin supporters and members throughout Monaghan and beyond. The 28-year-old also paid tribute to Hunger Striker Kieran Doherty, who was elected as TD by the people of Monaghan and Cavan, the same week 25 years ago. 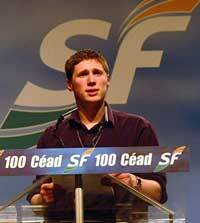 It is only seven years since Carthy was elected as Sinn Féin's first representative in Carrickmacross. Since that time the party has grown in strength locally and now has three members on the Town Council and two Councillors representing the area on Monaghan County Council. Carthy said there were many challenges ahead in his tenure as Mayor. "There is no denying that for many years this county has been ignored by those with the power and the purse strings. Not only are we, as a local authority, underfunded, but so are our schools, our health service and our hospitals. As Mayor I will continue to make my voice heard on these issues. Among my key priorities in the year ahead will be to campaign for and secure badly needed facilities for our town, particularly for young people. "I'd like to bring a fresh approach to the duties of Mayor, making this council more relevant and accessible to all sections of our community. I will also work with my colleagues from all parties on councils across Monaghan and in our neighbouring counties of Cavan, Louth, Meath, Fermanagh and Armagh", he said. Born in Birmingham, England in 1977, Carthy now lives in Carrickmacross with his partner Lynn and young son Seán. His mother was from Fermanagh and his father from Roscommon. At about two years of age the family moved back to Roscommon where the young Carthy lived until he was ten. The family then left Ireland again for a year this time to live in a town called Hollywell on the Welsh/English border. In the aftermath of incidents like the Birmingham bombing, Irish people living in England had a tough time. There was a significant degree of anti-Irish feeling, something Matt witnessed from teachers. After his one year stay at Hollywell the Carthy family returned to Monaghan where Matt continued his education. While not overly academic, Matt had a keen interest in history, "the Tan war stuff etc". While aware of republican politics from an early age, Carthy didn't know how to go about getting involved locally. But he was very keen. Growing up in an area like Monaghan, Carthy like others was aware of British occupation. "You always knew the border was there". The difference with Carthy as opposed to some of his peers, was that he wanted to do something about it. It was while studying at the Dublin Institute of Technology in 1996 that he and Pearse Doherty, currently Sinn Féin general election candidate for Donegal South West, set up a college Cumann. They worked on the Roisin McAlisky campaign. The Cumann was a nucleus for the emerging Dublin-based Ógra organisation which was established in 1997. Matt was the full time youth worker for Dublin. Working from the basement of 44 Parnell Square, he along with others, cultivated Ógra as a major outlet for republican youth and a key source of ideologically committed recruits to Sinn Féin. Mobilisation and education was the focus, developing youth politics through discussion and debate, with summer schools, seminars etc. Roof top protests were regular events. Carthy's election as Councillor in Carrickmacross in 1999 brought him back to his native county where for many years he juggled his council work with involvement with Sinn Féin's Press Office in Dublin. The Mayor's role, Carthy perceives to be largely symbolic. He would support Alex Maskey's wreath laying at the cenotaph in Belfast in memory of those who fell at the Somme, but like Maskey he would "never glorify such events". He also said that the role of Mayor, however symbolic, also had the capacity to "give ownership of consultation to people at local level". He enjoys his work as a councillor and gets a lot of satisfaction from serving the best interests of the people in his constituency. He continues to empathise with the issue of youth involvement. "Give young republicans the resources they need to develop their politics", he said. No task is too great or too small for Carthy. Our conversation was interrupted briefly by someone handing Carthy a pile of draw tickets- "You fill them in. I'm the world's worst at this stuff", the new mayor was told. No part is too big or too small as Bobby Sands said.